Three cheers for watermelon! This sweet, crunchy fruit reaches its peak in the summer—making it perfect for a picnic or BBQ—it’s colorful, refreshing & packed with vitamin C! It can be used in a variety of dishes (or simply sliced on a platter)! The gang at Marcia Selden Catering shares three watermelon recipes that will dazzle and can easily be made ahead. Pro tip: Tap on the shell of a seedless watermelon when shopping-if you hear a hollow sound it’s ripe and ready to eat! 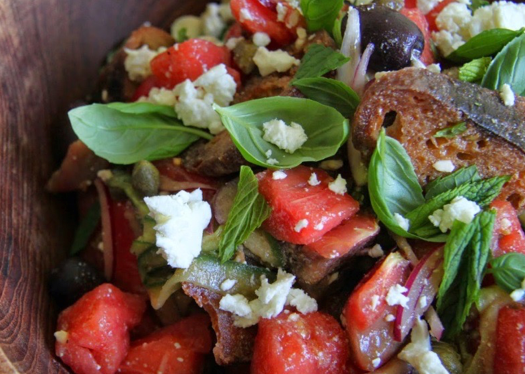 Enjoy these delicious recipes for: Watermelon Panzanella Salad, Tomato, Grilled Corn, Avocado & Watermelon Salad & Thai Watermelon Ceviche. This flavorful salad doubles as a salsa and is great served over grilled fish or chicken if you eliminate the croutons. in a large bowl and toss to combine. Pour over watermelon and gently stir in feta. Toss with toasted croutons before serving. All of the best parts of summer are combined into this bright, crunchy salad! Combine halved cherry tomatoes, grilled corn kernels, and watermelon in a large bowl. Drizzle with olive oil, lime juice, salt, cumin and cilantro leaves. Gently stir to combine and season to taste with salt & cayenne pepper if desired. Add avocado before serving. Tastes really awesome with the addition of crumbled bacon…Yum! This clean, simple salad will quickly become a summer staple. It’s also perfect for a dinner party because it needs to be made in advance. Serve in a martini glass or a Boston lettuce leaf for what may be the best salad you’ll eat all summer! Combine first 8 ingredients in a jar and shake well to combine. Combine onion, shrimp and watermelon in a bowl, pour vinaigrette over salad and gently stir to combine. Let sit at least 1 hour refrigerated before serving.